Even as far back as the early 1990s, during the initial years of Junior Seau‘s brilliant two-decade NFL career, the linebacker would complain to his then wife Gina of searing headaches. 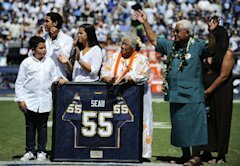 After Seau retired in 2010, his children slowly watched their dad’s famously charismatic personality grow distant. He began slipping away from them. The post-NFL life they all envisioned became a nightmare.